Cleaning (or "picking") hard crabs is an art. 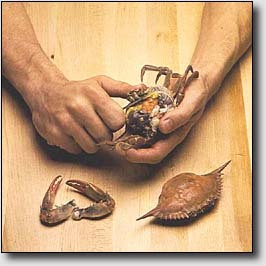 Professionals can pick a crab completely clean in under a minute while it may take an amateur significantly longer. Since cleaning and eating crabs is tedious and time consuming, it offers a great opportunity for fellowship with your friends and family... it's time well spent! The following instructions and photos are courtesy of the Virginia Marine Products Board. 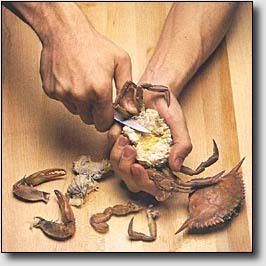 To obtain your very own "How to crack into a crab" wall poster, please visit their online store. 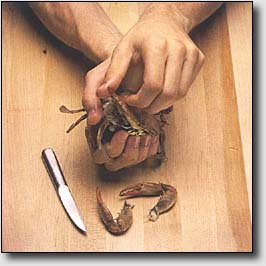 Remove the two large pincer claws by breaking them off at the body. Set the claws aside for cracking and removing the meat later. 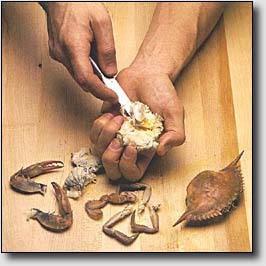 Hold the crab in one hand and lift up on one point to remove the top shell. 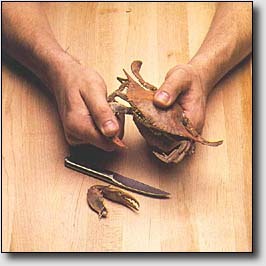 Cut off the "face" of the crab where it joins the lower shell and remove the internal organs by scraping them out with a knife. It is not necessary to wash the crab at the point. 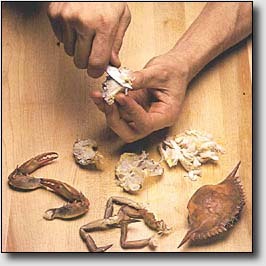 Make a straight cut from the back of the crab, just above the leg joints. This cut is important; be sure to make it deep enough. Repeat the process for the other side of the crab. Set the two pieces removed aside. Cut off (do not pull off) the remaining legs where they join the body. It is advisable to keep the thumb pressed securely over the backfin meat when making these cuts. Note where the flat, paddle-shaped swim fin or backfin is attached to the body. 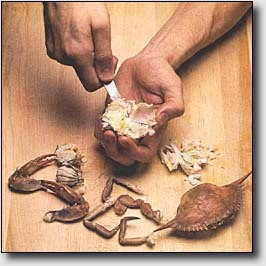 The rest of the white meat in the body of the crab is located in the chambers separated by thin walls of cartilage. Remove the meat from the chambers by sliding the knife under and lifting it out. This meat is called the "flake" or regular meat. 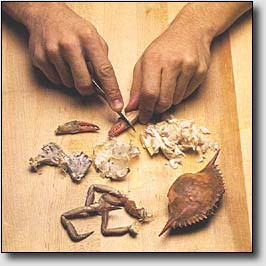 Remove the meat from the two pieces cut off the top of the crab in step 4. There will be one chunk of white muscle (the top of the backfin muscle) that comes off easily, revealing a piece of cartilage. Make a diagonal cut just under this piece of cartilage and remove the rest of the meat from the chambers. 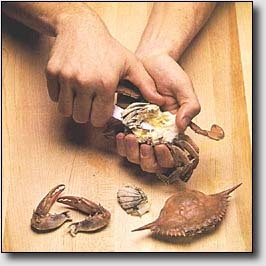 Tap the claw just below the pincher to make a straight, clean cut in the shell. Gently break the claw open and remove the meat with your knife. Repeat the procedure for the other claw.